Our Bumper Set is Gender Neutral! 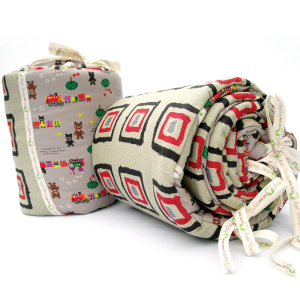 Buta Pig Reversible Bumper Set is a 100% cotton black twill with cute little painting pigs and balloons on one side and 100% natural linen twill with black, red & grey geometric concentric squares on the other. Near-one-of-kind Crib Bumper Set. This adorable bumper set is definitely a great choice for a little boy and/or little girl. Aunt Bucky designs let you get to mix-n-match what bumper set/sheet you want for your baby’s crib, not the “bed in a bag” choice that is so limiting on how you can create your baby’s nursery. SKU: AuntBucky_BP_BumperSet. Categories: Babies, Crib Bedding, Sale. Tags: Aunt Bucky, Baby Bedding, baby gift, bear crib bedding, cotton crib bedding, Crib Bumper Guards, Crib Bumper Set, crib set, motherhood, nursery, Nursery Decor, parenthood, pregnancy, retro crib bedding, train crib bedding, vintage baby. Buta Pig Reversible Bumper Set is on SALE for $30.00! 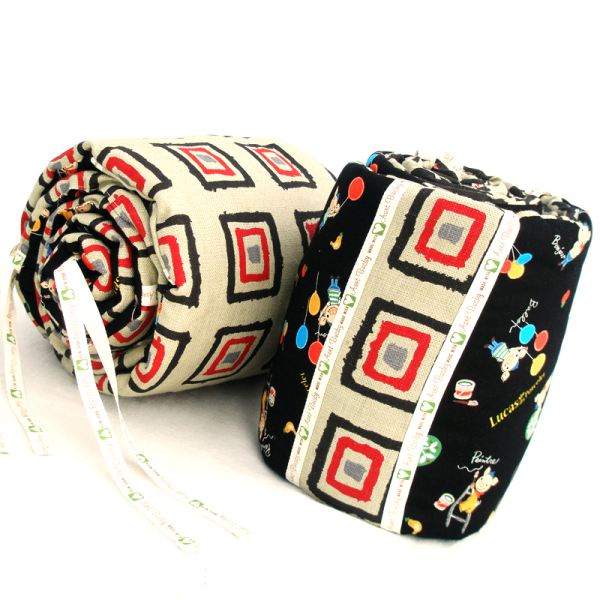 Buta Pig Reversible Bumper Set is a 100% cotton black twill with cute little painting pigs and balloons on one side and 100% natural linen twill with black, red & grey geometric concentric squares on the other. 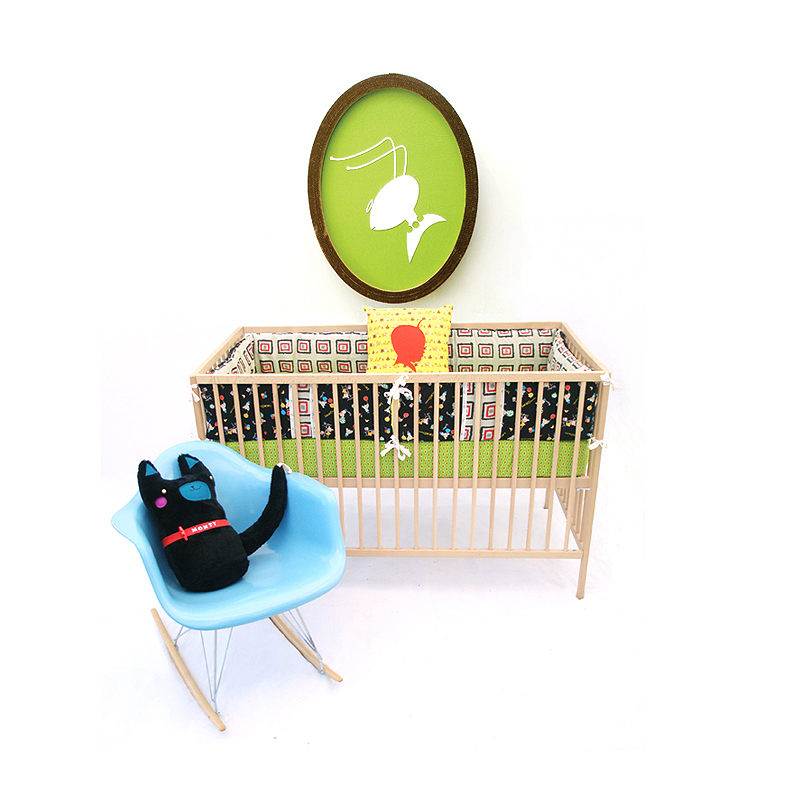 Near-one-of-kind Crib Bumper Set.mThis adorable bumper set is definitely a great choice for a little boy and/or little girl. Our bedding collection is one-of-a-kind, just think you get to mix-n-match what bumper set/sheet you want for your baby’s crib, not the “bed in a bag” choice that is so limiting on how you can create your baby’s nursery.Set includes two (2) 10 inch x 80 inch crib bumper guards with four ribbon ties sewn along both the top and bottom edges of each bumper guard with repeating ‘Made with Love Aunt Bucky’ design. Buta Pig Reversible bumper shell made of 100% cotton/100% linen fabrics with polyester twill ribbon ties & applique finishing trim and polyfil batting.